FIELD GRADE REPRODUCTION WWII GERMAN FIELD GREU KNIT SERVICE SHIRT. POCKETED VERSION. WORN UNDER THE COMBATT FIELD TUNICS. MADE FROM KNIT CLOTH MATERIAL JUST LIKE THE ORIGINALS. WORN BY MEMBERS OF LUFTWAFFE, WAFFEN SS AND HEER FIELD SOLDATS. MUSUEM QUALITY REPRODUCTION WWI BRITISH SERVICE 1909 OVERCOAT HAND MADE TO ORDER: PLEASE ALLOW 6-8 WEEKS FOR DELIVERY. WWI British wool overcoat Model 1909 Watch pocket Sized to fit over your tunic AVAILABLE SIZES: SMALL (36-38R) MEDIUM (40-42R) LARGE (44-46R) XLARGE (48-50R) 2XLARGE (52-54R) NEED A DIFFERENT SIZE? MUSEUM “HAND MADE” GRADE REPRODUCTION PLEASE NOTE: LIMITED STOCK ON HAND, PLEAE INQUIRE FOR AVAILABILITY, HAND MADE TO ORDER– PLEASE ALLOW 6-8 WEEKS FOR DELIVERY WWII GERMAN M44 LOW BOOTS LOW ANKLE BOOTS. FEATURES SMOOTH UPPER AND ROUGH LOWER NATURAL RAW LEATHER SECTIONS. CORRECT HELL IRONS AND HOBNAILS. THICK WHITE STITCHING. MUSEUM “HAND MADE” GRADE REPRODUCTION PLEASE NOTE: LIMITED STOCK ON HAND, PLEAE INQUIRE FOR AVAILABILITY, HAND MADE TO ORDER– PLEASE ALLOW 6-8 WEEKS FOR DELIVERY WWII GERMAN M43 LOW BOOTS LOW ANKLE BOOTS. FEATURES SMOOTH UPPER AND ROUGH LOWER NATURAL RAW LEATHER SECTIONS. CORRECT HELL IRONS AND HOBNAILS. THICK WHITE STITCHING. MUSUEM QUALITY REPRODUCTION WWI GERMAN M1910/14 FELDROCK PIONEER TUNIC. HAND MADE TO ORDER: PLEASE ALLOW 6-8 WEEKS FOR DELIVERY. 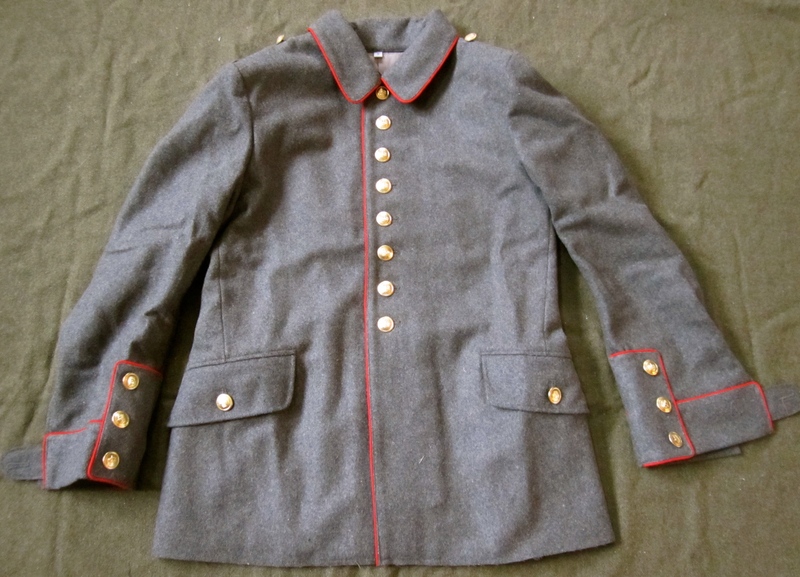 This jacket (also called the “Transitional” tunic by collectors), a simplified version of the M.1907/10 Waffenrock. This jacket almost immediately started appearing as the M.1910 was too complicated for wartime production. MUSUEM QUALITY REPRODUCTION WWI GERMAN M1910/14 FELDROCK TUNIC. HAND MADE TO ORDER: PLEASE ALLOW 6-8 WEEKS FOR DELIVERY. This jacket (also called the “Transitional” tunic by collectors), a simplified version of the M.1907/10 Waffenrock. 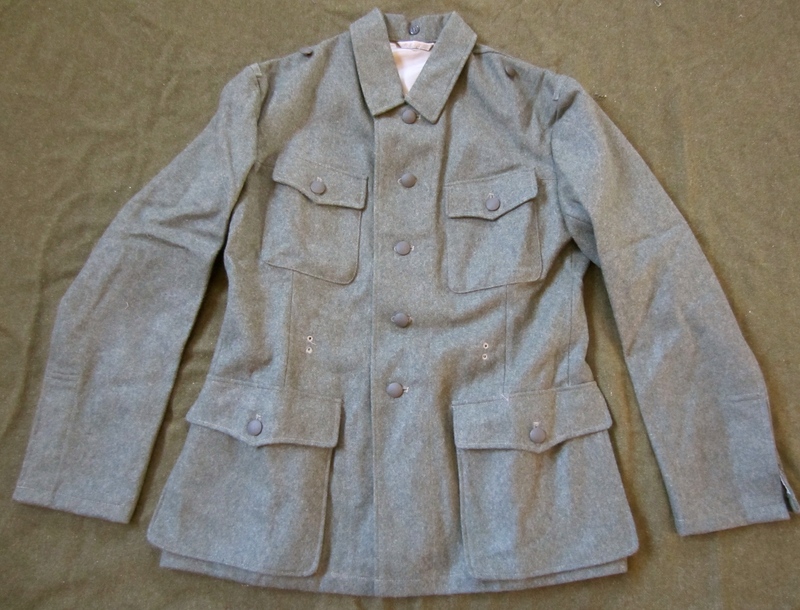 This jacket almost immediately started appearing as the M.1910 was too complicated for wartime production.